When Nia Hill was a child living in Boston, she and her mother planted green bean seeds on their small apartment balcony. Nia carefully watered the seeds daily and was fascinated as she watched them grow to small shoots and eventually to full plants that produced food she could eat. That experience sparked something in her that would lead to a career doing all the things she loved: nurturing, educating, gardening, teaching, and helping people become self-sufficient. When Nia returned to California five years ago as a single parent raising a toddler, she knew firsthand the struggle to make ends meet. The realization of how many people were hungry and could use help led her to start a nonprofit called Nourish Wellness which offers free or low-cost culinary, gardening, nutrition, and food resources online (www.nourish-wellness.org). While doing her research for gardening resources, she came across Merritt’s Landscape Horticulture Program. She signed up for a permaculture class which was perfect for what she wanted to learn and share. She loved the idea of planting in a sustainable way, similar to how plants grow on their own. When Nia found out about the department’s semi-annual plant sale, she was eager to help and became an intern. She was later hired as a student assistant and learned more hands-on experience from Anders as well as from Grounds Coordinator Molly Sealund on crop production and propagating plants and how to prepare them for sale. It was during that time that she became very interested in nursery management and began taking classes. She is now just one class shy from earning her AS degree in that topic (in addition to her certificates in Ecological Horticulture and Permaculture Design, an AA in Social and Behavioral Science, and a BA in English/Creative Writing from San Francisco State University). 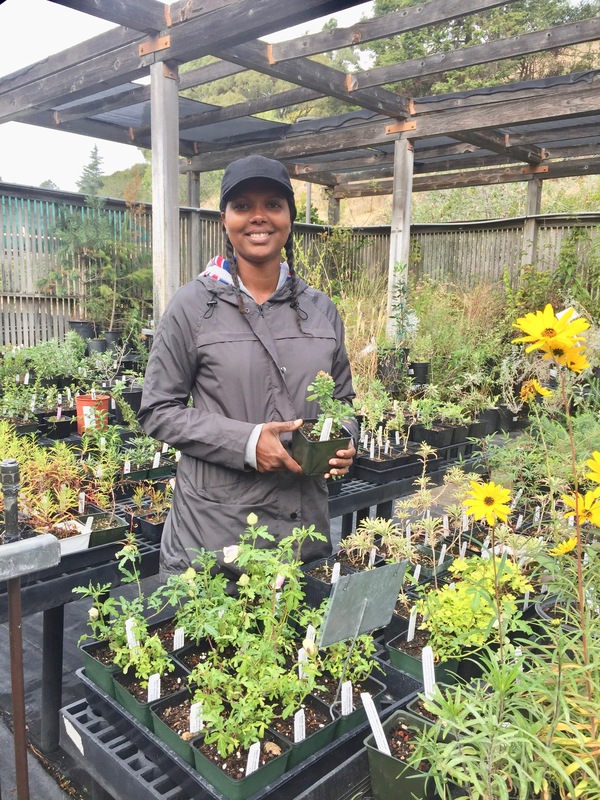 As an added bonus to Nia’s bucket list of dream jobs, she was given the opportunity to teach Plant Propagation this spring as well as Crop Production, Marketing and Sales.